We have added another 23 articles on your bStore, which includes lot more smaller packs. Since you will get more control on your Inventory, We always recommend you to choose the most appropriate pack size for your daily needs. But you can save more with big pack sizes. Another 25 articles added to your bStore. Now you have an option to estimate your order before funding your bStore account. With our latest release, you have a tool called “Krishna’s Calculator”. which will help you to find your fund requirements for your product needs. To get your estimated cost of the order, you must add your products to your Pre-Order list. Once your bStore trip plan opens, you will get the estimation from your Pre-Order Summary Screen. You will find the required fund information from Red color background column of the Krishna’s Calculator. You can use Online NEFT or NEFT through branch option to fund your bStore account only with the required amount. You can even collect more NEFT application forms from your bank and use the same to fund your bStore in the future. The NEFT application forms must be submitted to your bank only. And it needs authorized signature on the application like your bank cheque, but it needs only four banking hours to reach your bStore account. At bStore, we are doing lot of innovative moves to offer you with quality supply chain solution. In recent months, our team encountered many ways to manage and control the quality of the shipment package delivery to your business house. We identified most specific way of numbering and information mark for the delivery packages to control and manage the delivery without any problems popping up. And we named that numbering & information mark (symbol) as “I6 format”. I6 means “Information Six”. In the above mark, we have six information available and each package will carry this mark. 1. Last 3 Digits of your bStore invoice number. 2. Short Code of your business house name / Delivery Location. 3. Running number of the Delivery Package. 4. Total number of Delivery Packages available on the specific trip. 5. Our Service Brand Name (your “bStore”). And you will find the Delivery Package Running Number just before each articles listed on the invoice. 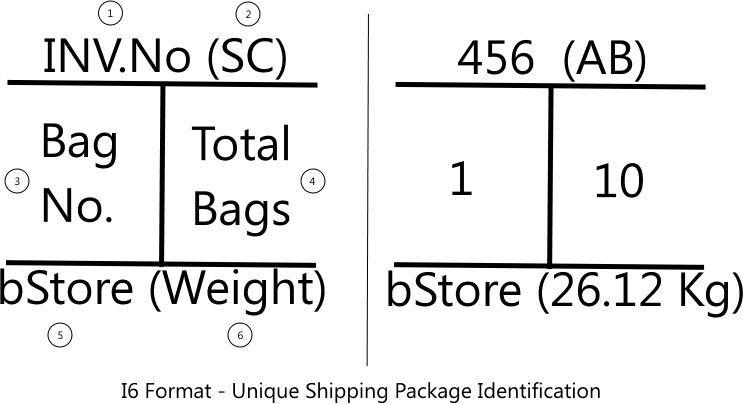 So you can easily identify the specific Delivery Package directly without opening every package. Since this mark has the total weight of the specific delivery package, you get 100% assurance that your package is not unpacked without your knowledge. Also in our warehouse, Each product is double checked by our delivery process and our warehouse staff members will get an instant automated warning message if the estimated weight of the delivery package is not equivalent to the actual weight of the delivery package from integrated warehouse management system. You can simply collect your delivery packages and store it on your storage area without opening and verifying each delivery packages, because it’s being guaranteed by our Advanced Information System for you. By storing it as a package, you will get more control on your business house inventory, also you can easily implement FIFO (First In & First Out) for all your products. You can also store all your packages in the smallest space of your in-house storage area. As we heard from one of our loyal customer that, they were having problem in terms of calculating the total fund required for specific trip plan. And also they suggested us to build some tool, which can calculate the fund requirement much before the trip closing so that they can drop an exact amount of money and continuous with their purchasing. That’s is where we realized the potential behind this requirement and started our experiment on this. Immediately it’s being planned and started with our development team. Yes, it’s been named as “Krishna’s Calculator“. But Why ? Krishna is the one, who suggested this feature. And he is part of the Management Team at Shanmukha Restaurant, Marathahalli. but what you can really do with this ! 1. You can go through your products at anytime. No waiting for store opening anymore. 2. You can also add your products to your Pre-Order List at anytime. 3. Get your estimation as soon as your bstore opens. 4. You have additional options of sorting by Category and Name at your Quicklist.